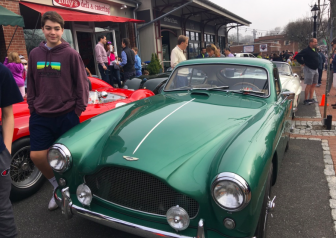 Thousands of auto enthusiasts and local residents headed to downtown New Canaan Sunday morning for the first of four Caffeine & Carburetors shows planned for 2019 (click album above for photos). 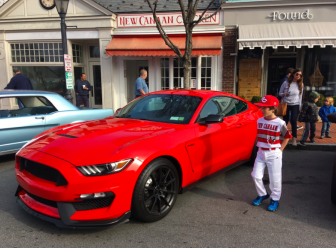 Those attending the popular gathering of speciality and classic autos on Pine and Elm Streets snapped photos on a clear, warm day. The Community Emergency Response Team and C&C volunteers bolstered the efforts of New Canaan Police to direct pedestrian and motor vehicle traffic and ensure the event ran smoothly and safely, as always. Show sponsors include Bankwell, Blackbridge Motors, Miller Motorcars, Hagerty, Meccanic, Automotive Restorations Inc.
Several local and area nonprofit organizations set up tents along the sidewalks to promote their efforts. 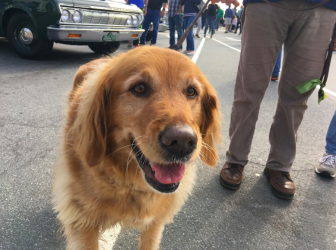 Caffeine & Carburetors will be held twice more downtown this summer—on May 19 and Sept. 15—before wrapping up the season at Waveny on Oct. 20.